It is a simple way to talk privately with the user of another system. It is self contained. Except for an ISP, connections across the internet do not depend upon the availability of third party services. Creation of external facilities or registration with their providers are not required. Additional financial commitment is not needed. The user prefers to work by clicking buttons rather than by typing commands. Their interest is in using their system rather than understanding its technicalities. Beyond the applications they normally use day-to-day, they have low levels of confidence in their technical abilities. When something unforeseen occurs, they rely upon the expertise of someone else to resolve it. Something happens that the user wants to discuss with someone else. Just like making a regular 'phone call, the user calls the service that the other person provides and the conversation takes place. The user’s preference is for a basic service that is simple, familiar, and obvious to use, rather than a complex one that offers many features and is unclear how to use because of the large number of optional settings they might have to handle. If you are connecting via a local network rather than the internet, there is no need to forward any ports to the provider system. In that case, both provider and caller systems must be in the same local network i.e. behind the same local network firewall/router. The first time you run call mode, a wizard will open advising you how to set up Mumble for your particular hardware. This is the application that 1-to-1 Voice uses to talk with the service provider. Follow the on-screen prompts to conduct the set up procedure. Refer to section Fine Tuning to change the configuration after initial set up. 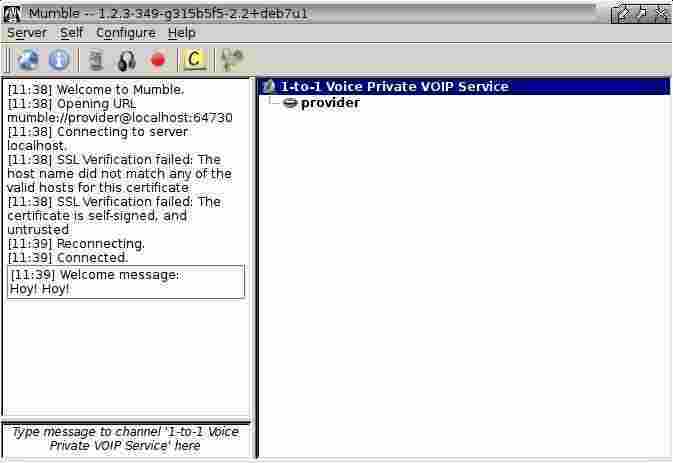 If you have previously run provide mode, or Mumble as a separate applicaction, 1-to-1 Voice will automatically use the set up you created at that time. In such a case, setting up again is not required. 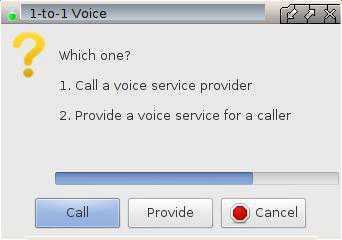 The first time you run call mode, a window will open asking whether you want to accept an SSL certificate from the service provider. Click Yes to accept and store the certificate. A window opens to indicate the connection has been made to the provider service. When both caller and provider are listed, you are ready to hold your private conversation. Each firewall/router handles port forwarding in its own way, this means there is no single description that can cover all variations. You should refer to the user manual to do the setting up. If you are connecting via a local network rather than the internet, there is no need to forward any ports to the provider system. To provide access across the internet for a caller system, a connection must be made to the external IP address of your local network firewall/router. This is different from the internal address it uses on your local network. A home firewall/router will usually have its external IP address assigned by your ISP. Often the ISP can change this external address without your knowlege and without affecting your access to the internet. This means your external address must be confirmed before each call can be started. Supply the IP address to the person operating the caller system, via email or some other means. If you are connecting via a local network rather than the internet, supply to the caller system operator the IP address of the provider system. The service starts and you will be automatically logged in as an unprivileged user named provider. The first time you run provide mode, a wizard will open advising you how to set up Mumble for your particular hardware. This is the application that 1-to-1 Voice uses to talk with the caller via the service you are now providing. Follow the on-screen prompts to conduct the set up procedure. 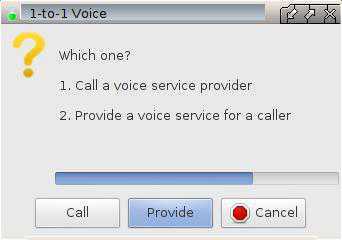 If you have previously run call mode, or Mumble as a separate applicaction, 1-to-1 Voice will automatically use the set up you created at that time. In such a case, setting up again is not required. A window opens to indicate you have joined the service. When a caller joins the service, you are ready to hold your private conversation. Close Mumble in the usual way via its window or icon in the taskbar. This automatically closes the Murmur service. In cases where two or more systems are present at your site, each of them may provide an independent 1-to-1 Voice service. To provide a service to any system across the internet and local network, each system providing service must have an individual configuration as described in the following steps. Your local network firewall/router must forward a unique port number to each system e.g. 64730 (default), 64731, 64732, etc. In the files, find the section that specifies the port number, enter the required value, and save the file. # Mumble to join the local Murmur server as the user named provider. You should advise the caller to enter the entire details in order to successfully contact your service. It must not contain any spaces. The colon is required between the IP address and port number. Usually the initial settings created by the Mumble Audio Wizard do not have to be changed for 1-to-1 Voice to work. The wizard may be run again or other settings modified from the main window. Because of the large number of items that can be changed it is impractical to cover more than a few basic options. The Mumble web site is the preferred starting point for further information. A range of devices that are specific to each individual system will be available to choose from. Often the lists will include a default device. Selecting such a device will usually produce a working result, but it may not be the optimum choice. Try the other devices and monitor the difference in CPU demand. It might be possible to obtain a working result that uses fewer resources. In a conversation between two people this is of little use and may be disabled. In a two person session it is preferable to disable this and use sounds instead. The most convenient option is to choose to transmit continuously. This produces the highest demand for CPU. Prefer the Voice Activity option to reduce the demand. Installing mumble-server (Murmur) by default starts Murmur as part of the boot-up routine. This is not needed nor used by 1-to-1 Voice. If you are not providing another independent Murmur service on this system, you can reduce the otherwise wasted CPU and RAM usage by preventing this automatic action. Alternatively, run the first command, then reboot the system. The SuperUser account is the inbuilt administrative account for Murmur. 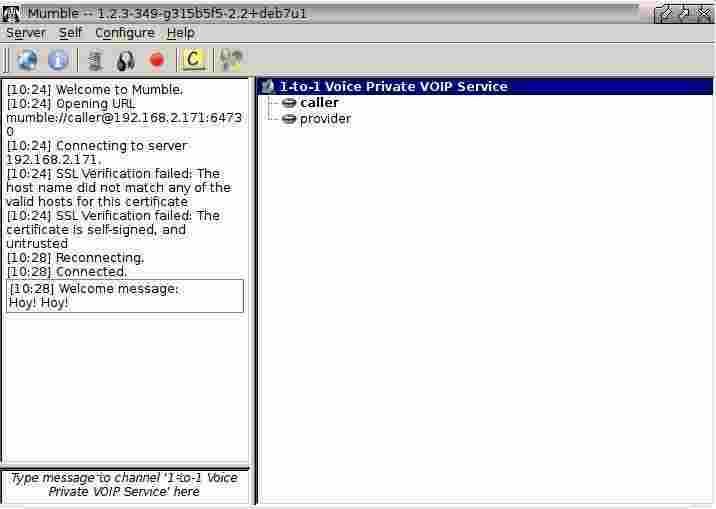 This is the application that 1-to-1 Voice uses to provide the service for a caller. It is different from the administrative account for your operating system which is usually called root, but occasionally may be referred to using the generic term superuser. 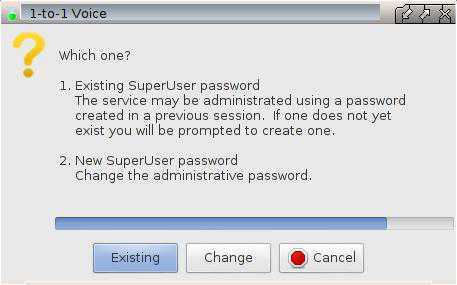 The SuperUser account is not required to provide a 1-to-1 Voice service. Because it is not needed nor used by 1-to-1 Voice, the default setting is for it to be switched off. The facility to activate it is provided only as a convenience for interested users. Any changes made via the SuperUser account are deemed to be beyond the scope of the 1-to-1 Voice project. The SuperUser account accesses Murmur via the Mumble interface. You can activate the account by changing the settings in the appropriate configuration file. In the file, find the section that enables to account. The default setting is for it to be left empty (blank). Simply enter the letter y and save the file. If a button is not pressed, Existing is automatically started after a timeout. When the Mumble window is displayed you may sign in using SuperUser account.